Today was a BIG day. Not only was there an important football game (I don’t want to talk about it…), but I got my Holiday Swap Secret Santa gift! It was a wonderful surprise. My dad walked into the kitchen and said, “You have a package from the South Pole!” And it was TRUE. Apparently Santa lives…in Antarctica! Or at least my Santa does. Although the package said Las Vegas as well…I don’t know what that’s about. KIM is my Secret Santa! 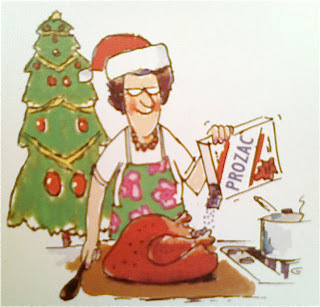 And she is a huge sweetheart, as you can see – I got loads of lovely stuff. First, Marilyn Brant’s According to Jane (so I get to keep my very own copy, even while I give away one in my Everything Austen contest). Second, a Vera Bradley notebook! I HEART Vera Bradley. You know those college girls you see toting around their books in quilted bags? That’s me a couple years on. I can see myself writing many blog posts in this notebook! 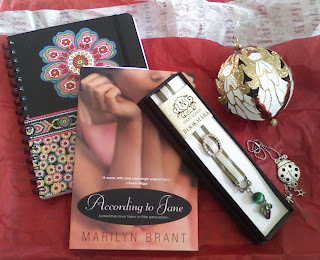 Add to that an extremely classy bookmark, a glittery, angelic ornament, and a ladybug charm (love ladybugs! ), and I got the best gift box ever. Don’t even argue. It is. What a lovely package! The notebook, ornament and bookmark are just gorgeous. I love ladybug stuff! gorgeous idea - lucky you!! 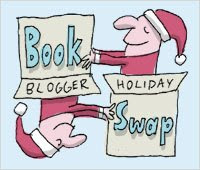 AWESOME Holiday Swap! You got such fun great stuff! Mine is sitting wrapped under the Christmas tree still. 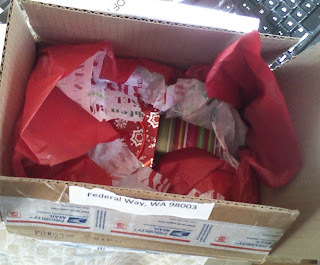 I can't bring myself to open it yet, even though I'm dying to! Woohoo! You got a great gift! Nice gifts! Kim is such a sweetie! fun stuff. didn't know vera did notebooks! awesome! I love it. How lovely. Gorgeous ornament! I have that ladybug charm! It used to be on my rearview mirror. When I got into my accident about a year ago the car (and mirror) didn't make it but the charm came out just fine. So now I keep it in my room as a reminder.